Skatefresh is thrilled that one of our most exciting clients Louise Jones has just opened her own business and is offering fellow Skatefreshers a one-off 15% discount. After rediscovering her love of skating with Skatefresh last year, her outstanding abilities on wheels got her part in a BBC pilot alongside Asha. 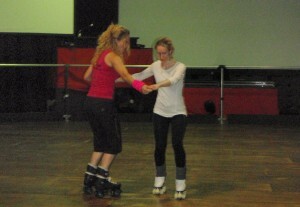 The show, for which she prepared last October, had Asha teach Louise SkateDance in virtually no time. Louise then had to test her new found, impressive skate skills against a professional (inf ront of a live studio audience). When not rolling on eight wheels Louise is a beauty therapist and has set up her studio in Covent Garden where she offers a holistic and natural approach to beauty therapy. So if you feel it’s time to get the winter fur off (as it’s time to skate in shorts), or simply and without reason want to pamper yourself with a facial, massage or pedicure in the skilled hands of a fellow skater then we strongly suggest you make use of this incredible offer. Asha is already booked in for a facial and eyebrow threading in April (and is very excited). Simply tell Louise you’re a Skatefresh client when making your booking and off you go for a beauty session that’s feel good for yourself and your summer budget.